Step 1. Draw your bauble design directly onto the acetate sheet using a black Yoken Marker and an EverZart Permanent Pen for thinner lines. Make sure to use permanent markers or it will smudge. Step 2. Drop Pinata Alcohol Inks over the top to fill in the blank areas. Step 3. 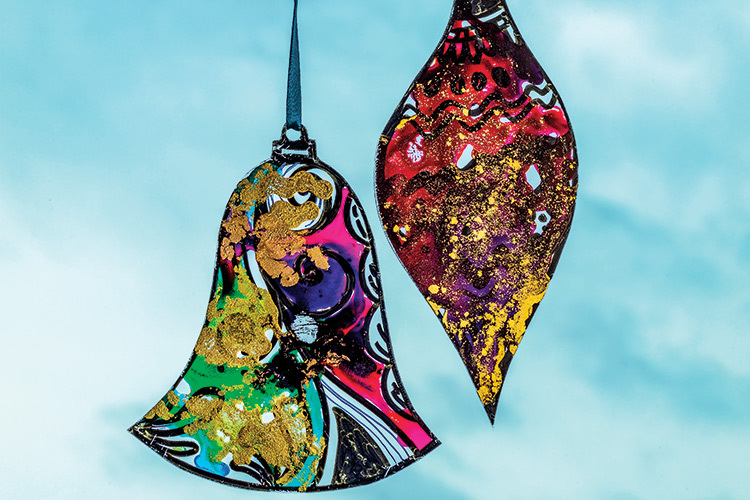 Allow the inks to dry completely before cutting out the bauble. Step 4. Punch a hole in the tip and thread with coloured ribbon to hang.